Avid.legal is a corporate and commercial law firm based in the heart of NZ’s capital city, Wellington. Serving clients throughout the country and around the globe, members of Avid.legal have been supporting TAGLaw since 2009. The firm specializes in a number of areas including corporate and M&A, capital raising, shareholder arrangements & joint ventures, compliance, financing & securities, restructuring, negotiating & drafting contracts, IP, sales & distribution arrangements, teaming & reseller agreements, franchising, development & management arrangements, and technology law. Over the past month, TAGLaw staff and members have travelled the globe attending Regional Meetings in Dallas, Belfast and Atlanta. 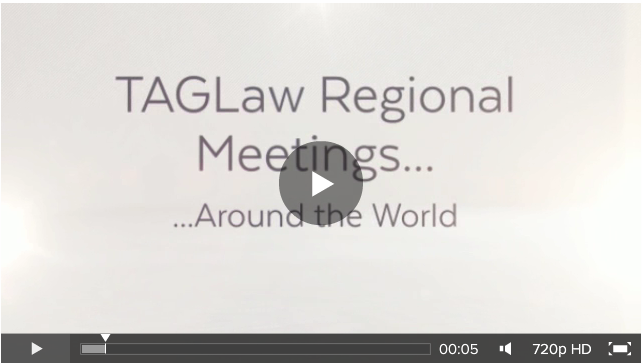 These Regional Meetings provide members with the opportunity to build and maintain strong relationships with other firms, share best practices and allow others in their firm to experience TAGLaw and the TAG Alliances. The Spanish legal magazine, Expansion Jurdico recently featured Bufete Escura (Barcelona, Spain) and TAGLaw. Founded in 2003, Legalmax is recognized as one of the leading law firms specializing in provision of legal services on key issues related to the registration and protection of intellectual property in Uzbekistan and Kazakhstan. Conducting business in Russian and English, the firm specializes in challenging and protection of intellectual property rights, suppression of unfair competition and protection from counterfeiting, IP-monitoring and more. For several consecutive years, Legalmax's dispute resolution and intellectual property practices have been recognized as strongest in the region by Chambers Global, The Legal 500, and "Intellectual Property Magazine". In addition to intellectual property matters, the firm can also assist in a wide variety of legal services in the CIS region. Valdes, Suarez & Velasco, located in San Salvador, is a highly regarded firm specializing in structured and international transactions, infrastructure projects and litigation, offering the benefits of a boutique firm, while each of its founding partners also offer a complementary and specialized area of practice.